Handmade from a 4 ounce genuine baby food jar. Choose your options below and I will make your candles fresh. Our fragrances and colors are phthalate free. Our wax is 100% pure soy wax. All ingredients are cruelty free and pass California Prop 65. 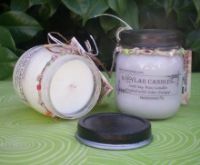 Read "The Benefits of Soylar Candles" for more information on our products and ingredients. Candles no longer come with the option to add beaded ties. I want an unpainted lid. I want a black handpainted lid ...Add $0.15 A lid is not necessary.